A bird’s eye view of a property reveals a three-level indoor/outdoor living area and kitchen, a large pool with a fountain and jumping board and a fire pit. LANDSCAPE ARCHITECTURE: Kane Landscapes, Inc.
Crema Eda marble and Hartstone slabs enhance an extensive patio. Lush, colorful plantings embellish a timber pergola. A pool house accommodates a slide and diving board—both cleverly de-emphasized by seven-foot-wide water weirs that create a visual barrier and soothing waterfall sounds. An award-winning pool project includes a waterfall and a raised patio with spa, fireplace and custom fountain. LANDSCAPE DESIGN: Kane Landscapes, Inc.
A pool house accommodates a twisting, 37-foot-long water slide. Kane created a backyard retreat featuring a three-story outdoor room, pool area, outdoor kitchen and play area. 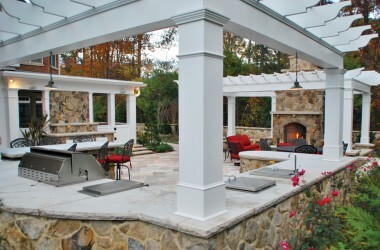 The outdoor kitchen is a great spot for hosting evening gatherings.